In a Nutshell: For anyone with questions about credit cards, CreditCardForum offers an online community of people ready with answers. Founded in 2008, the forum hosts almost 20,000 active users who discuss salient credit card topics every day. Whether you’re wondering about the rewards of a particular card or your chances of being approved by an issuer, you can quickly find an answer by posting a question or searching through existing topics on CreditCardForum.com. Letting users stay anonymous, the open forum fosters a safe environment for honest opinions and news in the financial sector. As a college student, I put off getting my first credit card for a long time, not because I didn’t want one, but because I was new to credit and didn’t want to ask embarrassingly simple questions. Conversations like that didn’t exactly leave me feeling bathed in knowledge and confidence. Honestly, the main lesson I got out of it was not to broach the subject with people I know. Even if they know the answer, it’s not worth it to ask. Credit cards are a sensitive topic. Not everyone is willing to openly admit they have questions or issues on such a personal level. People feeling lost in their own finances need a safe space to learn what to do or expect. CreditCardForum provides that space. Through its online community, this site provides an easy and anonymous way to get specific answers about credit cards. Since its founding in 2008, the forum has committed itself to consumer-driven education, dedicating its content solely and specifically to credit cards. 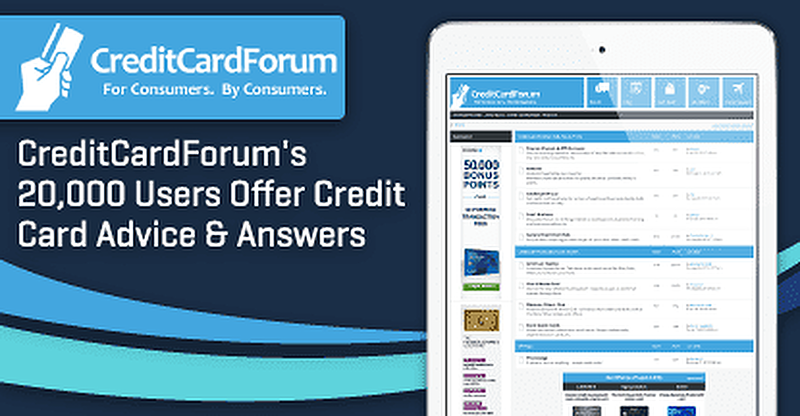 Today, CreditCardForum has 18,665 members who have contributed 85,628 total posts in 9,672 topics on the site. A comprehensive resource, CreditCardForum covers credit card issues such as rewards, fraud, and issuer news. Whether you’re curious about a major issuer or a store-issued credit card, the site has a discussion forum ready to supply answers to your question. CreditCardForum is the largest online discussion board of its kind, focusing specifically on credit card topics (rewards, requirements, balance transfers, business financing, building credit, etc). Every day many thousands of people visit the site. Anyone is free to read the content and posts; however, to take part in the discussion, visitors have to sign up with an email address and username. Ben Woolsey became President in 2014. From business travelers who know all the ins and outs of rewards to customer service agents from major issuers, the forum’s membership has no dearth of expertise. If, for whatever reason, your question has these knowledgeable users stuck, Ben is happy to swoop in as moderator with an answer. An in-house team of web editors and technical whizzes maintains CreditCardForum with a single-minded objective: to inform consumers about all aspects of credit cards. Through its forum, blog posts, and featured credit cards, the site offers easy access to all the answers a consumer could want or need — from applying for a credit card to asking for a credit line increase. Ben and his team are glad to provide a place for people to share information and get answers from the site’s forum or blog. On CreditCardForum, consumers share stories and ask general questions about credit card issuers, new products, and tips for maximizing rewards. General Credit Card Talk is the most frequently visited topic, with Rewards a close second. As you navigate the world of credit cards, you’ll find a dedicated space full of conversations and queries in a wide range of topics. On the forums, consumers ask questions and give advice about credit cards in a secure, friendly environment. Of course, to engage directly in the conversation and ask a particular question, you’ll need to sign up as a member. Then you can post as much as you like. New members often post to ask what their odds of getting approved for a certain card are, which Ben says is among the forum’s most frequently asked questions. CreditCardForum members analyze each other’s unique circumstances and give detailed answers in a lively back-and-forth. Following trends in credit card news, CreditCardForum’s blog posts range from general step-by-step guides to detailed analyses of changes in benefits on a particular card. The site never lacks new topics to cover because the forum itself provides a constant stream of writing prompts. “Some of the earliest warnings that we get on things that are going on in the credit card market come from members themselves,” Ben tells us. These average people often report what they’re experiencing firsthand, bringing new topics to the forefront. Many members deal with issuers and handle credit cards on a daily basis, so when terms change or a new loophole is discovered, these savvy individuals are the first to know and pass along the information. CreditCardForum learns from its user base and expands on salient credit card news in regular blog posts. The team has the research and technical skills to write in-depth on any topic, but it’s the insight of members that points CreditCardForum toward the issues that concern consumers. With responsive content, the site continually informs readers on hot topics of the day. Eventually I did pick out my first credit card, relying on my own best judgment, but I could’ve saved myself a lot of time (and aggravation) by using CreditCardForum to find out what I needed to know. When you have serious questions about credit cards, you can trust CreditCardForum to have complete and knowledgeable answers. Many down-to-earth users bring their own personal experiences and honest opinions in a lively discussion about credit cards. The forum is a welcoming space for tips and recommendations. Additionally, the site’s consumer-driven content outlines rewards, explains interest rates, releases issuer news, and acts as a resource of all types of credit-related topics. Amber Brooks is a Contributing Editor at Digital Brands. She spends her days consulting with financial experts to bring readers the best recommendations and tips on the web. She's interviewed financial leaders from all around the world. With a background in writing, she's uniquely suited to diluting complex jargon into terms that are easily understood. When not obsessively budgeting and storing away savings like a squirrel stores nuts, Amber can often be found with her nose in a book.